Business Process Management or BPM (sometimes called BPS or BPO) the practice of managing and automating an organization's commercial business processes to raise productivity, increase efficiencies, reduce costs and raise profits. 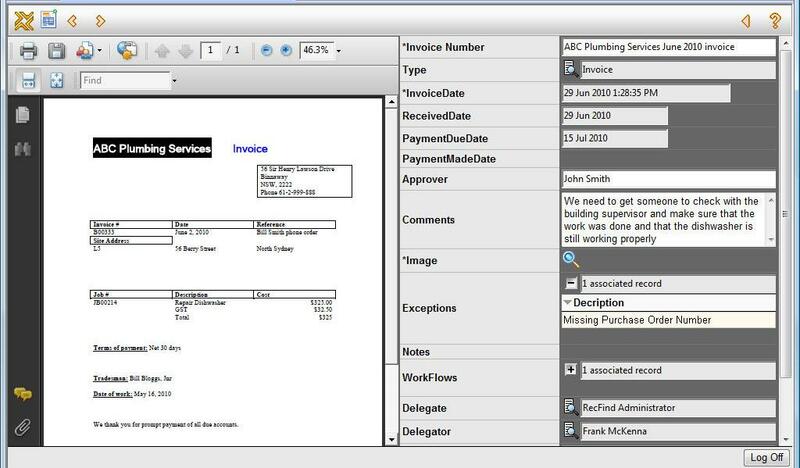 The following screen is typical of the type of functionality (Accounts Payable in this example) that can be configured for clients in just a few hours. Knowledgeone Corporation (K1Corp) released its new suite of BPM tools on July 1st 2010 for those vendor organizations offering business processing services and solutions. These services are usually associated with the acronyms BPO, BPS and BPM. Note that the same BPM suite could be used for insourced as well as outsourced processing. That is, the BPM toolset can be used by both BPO providers or client organizations directly in order to optimize most business processes, such as, customer requests, purchasing, accounts payable, accounts receivable, HR processes, loan document (packet) management, etc. The suite contains everything a vendor or client would need to provide Business Process Management (BPM) services. It also contains all the high level tools required to tailor each solution to the exact requirement of the client and to build prototypes in hours or days, all without programming. The new suite is based on the widely successful and proven RecFind 6 product suite, installed and operational all over the world with K1Corp clients. It is the result of five calendar years of research and development by K1Corp at its North Sydney Development Centre and is based on the very latest Microsoft .NET technology and tools. K1Corp has been a Microsoft ISV for over 22 years. 1. Totally configurable and scalable relational database based on SQL2008. 2. Powerful application management tool that is used to create and configure both the data model and all business processes. 3. Powerful prototype/demo build tool to build fully functional applications within hours or days without the need for programmers. 4. Totally configurable client software, both browser-based and .NET smart-client architecture. 5. Powerful ECM-like back-end application that includes all the required functionality (e.g., imaging, workflow, security system, report writer, audit trail, full-text, Metadata and Boolean searches, etc). 6. Powerful data import tool that can import and map any type of data, including images of any type, from any source using the very latest .NET connection string technology. 7. Powerful data export tools providing standard output formats like XML, CSV and native format. 8. Powerful and highly configurable data capture tools for both the client and batch environment able to capture data from any source and created by any application. 9. Powerful integration tools to allow the application to be easily integrated with any other applications including SharePoint. The whole suite was designed using Service Oriented Architecture (SOA) and components share a common API and communicate with the back-end database via a common security system. A single user/access security configuration governs all components regardless of how they communicate with the database. The vendor or customer using this new BPM suite will usually not require any other tools. It has been designed as a total solution for Business Process Management. One of the most impressive and unique features of the K1Corp BPM suite is that configuring a unique solution for a customer does not involve source code changes. This means that every solution a vendor offers is based on a standard, proven, stable and fully-supported product. The K1Corp BPM suite removes a massive amount of cost and risk from the BPM marketplace and adds many new layers of functionality and flexibility; for example, the browser-based client supports the new Apple iPad (see screen shot below) as both a review and correction device for key client documents. K1Corp also accept all the responsibility for ensuring that the system is constantly improved and kept up to date with ever-changing technology. This service alone reduces the vendor’s future costs by millions of dollars. The license agreement includes both support and free upgrades. The package also includes an array of services including training, consultancy and onsite technical support.